The Buzz Piece » Charlie Wedemeyer’s 32 years of battle with ALS ends. HomesportsCharlie Wedemeyer’s 32 years of battle with ALS ends. 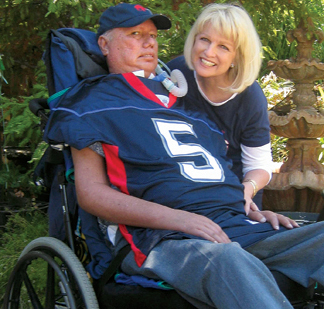 Jun 04 Charlie Wedemeyer’s 32 years of battle with ALS ends. And how valorously Charlie Wedemeyer fought until the very end can be determined by the fact that he survived the incurable amyotrophic lateral sclerosis (also known as ALS or Lou Gehrig) for 32 years when as per ALS Association, out of the 5,600 people in the US who are diagnosed with ALS each year, only about 20 percent live five years and less than 5 percent live 20 years. It was indeed a long battle for him and his family. Charlie Wedemeyer has been known to us as much more than a former Los Gatos High football coach or a onetime football star. His passion for life and never say die attitude contagiously brought cheer and joy wherever he went and made him one of the most admired football icons in United States. In his own words, “Pain and suffering are inevitable we all experience it. But misery is an option,….we do get to make that choice.” He said this in 2005 and lived it all his life. Despite of suffering from ALS since the year 1978, Charlie Wedemeyer continued to coach at Los Gatos High School in California from the confines of his equipped high chair and his wife’s help who became his voice after he could no longer be heard clearly. And under his guidance, they even won the sectional championship. His life is chronicled in a couple of television films made on him and in the book he wrote, Charlie’s Victory. He was 64 years old. What a touching story – a fighting champ all the way to the end. Great coverage, well written.